Al Pacino + Shylock’s “hath not a Jew” speech = OMG cumshuckin’ unbelievable! Post-Holocaust, The Merchant of Venice has shifted from being a typical Shakespearean romantic comedy to one of his problem plays. The “problem,” of course, is Shylock, written as a stock villain (albeit one presented with a great deal of humanity) who today is seen as the play’s victim. Modern audiences gasp when Shylock is forced to accept conversion to Christianity as a condition of his life being spared—and directors even turn this into the worst of punishments, as Daniel Sullivan did in this production—though in Shakespeare’s time, it truly was an act of great mercy. Thus, shifting the play’s center to Shylock’s tribulations renders the whole fifth act ridiculous. 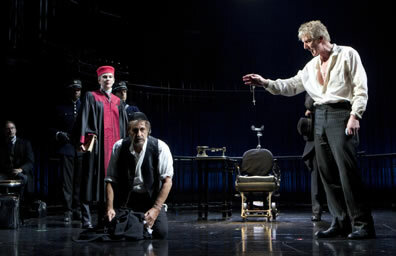 From left, Lily Rabe a Portia, Al Pacino as Shylock, and Byron Jennings as Antonio play out the trial sceen in The Merchant of Venice at The Broadhurst Theatre. This production was as much a commentary on commercial excesses as it was on racism. Photo by Joan Marcus, The Public Theater. First mounted at Central Park last summer before moving to Broadway for a twice-extended run, this is not only a post–Holocaust Merchant, but also a post–Lehman Bros. Merchant. Set in Venice at the 19th century’s turn to the 20th, it opened in a stock exchange with Mark Wendland’s set featuring a metal trading board (a giant abacus), gates, grates, and a stairway shifting over the course of the play to present Shylock’s home, Belmont, and the courtroom. The setting introduced us to Antonio, the titular merchant, who wrapped himself in a mantle of privileged wealth and stout Christian morality, both of which he used to abuse his competitors (Shylock among them), bully his colleagues (Salerio and Solanio) and manipulate his protégé (Bassanio), all the while making his own commercial and emotional interests his true anchor. In our own age of morality-spewing-but-amoral financiers and politicians, Antonio (Byron Jennings) was frightening, and his self-serving actions caused the disintegration of Belmont’s society at the end of the play. While still generally unsatisfactory, this production’s uncomical fifth act at least adhered to the post-financial meltdown theme as each character went his or her separate way, rent by betrayals brought on through Antonio’s demands (Bassanio giving up Portia’s ring) or endorsements (Lorenzo eloping with Jessica). And wouldn’t you know it, Antonio’s estate was intact if not wealthier than ever amid the ruin of all the rest. This production brought to the fore the play’s theme of false appearances, as played out in comic form with the test of the three chests for Portia’s hand in marriage. The play’s moral center was Bassanio’s speech in choosing, correctly, the lead chest. Extolling the virtues of honest character and disdaining the need for rich, outward appearances, he also condemned those who would present themselves falsely, “the seeming truth which cunning times put on to entrap the wisest.” As David Harbour delivered this line, we remembered that it is the Christians who literally wear the masques and disguises in this play and who scam Shylock while the Jew stays true to his vow. In light of the overarching theme of appearances, who are the true villains (even in Shakespeare’s mind)? This speech also set up the production’s shift in tone from comedy to drama just a few lines later when Bassanio, upon receiving word of Antonio’s peril, admitted to Portia that he himself was not what he seemed when he presented himself to her. We sensed Portia’s distrust beginning then, and thereafter Lily Rabe’s Portia devoted her actions to reasserting her own self-worth and social (if not financial) power. In the end, while Bassanio realized he had lost his “true love,” Antonio realized he had encountered a force more dangerous to him than even Shylock—a young woman, at that. So we arrive seven long paragraphs into this essay without mentioning the name Al Pacino, who played Shylock. That’s a testament to the overall production’s strength and strong ensemble work. Nevertheless, when a truly great actor delivers one of Shakespeare’s great speeches, it can be a highlight of a life well lived: Al Pacino + Shylock’s “hath not a Jew” speech = OMG cumshuckin’ unbelievable! Pacino’s whole performance as the Jew of Venice is masterful, far, far removed from his portrayal in Michael Radford’s 2004 movie. He so inhabited Shylock we regarded him more as an old workplace acquaintance than either a villain or a victim-hero, someone whose wisdom and wisecracks we can admire while being uneasy with his extreme social and legal views. Pacino’s was a quiet, understated Shylock. He delivered his lines in a measured, Yiddish rhythm, but just as important were the silences he breathed into the spaces between the lines. We watched him pondering, measuring everything from the merits of dealing with the Christians in the first place to his trepidation at leaving his daughter alone on the night of the masques. Even in the courtroom he paused, briefly, before each demand for justice. However, ironically, he delivered his “hath not a Jew” speech in a rapid ascent of speed, rising and falling in volume until the crescendo of “If a Christian wrong a Jew, what should his sufferance be by Christian example?! Why, revenge! !” A dangerous sentiment, but in both the way Pacino said it and in context of his entire portrayal, we came near to cheering. Pacino wasn’t alone in this slow pacing. Almost all the characters delivered the script in such deliberation, which particularly helped highlight Bassanio’s chest-choosing speech. The exception was David Aaron Baker as Gratiano, a drunkard in the early scenes who gave up drink upon proposing to Nerissa (Marsha Stephanie Blake) and then returned to the bottle in their falling out over the ring. Thanks to all the other measured performances, Gratiano sticks out as the truly grating character Shakespeare probably intended him to be. Rabe’s slowing down Portia’s speeches turned the heroine into a mature woman of wisdom rather than a spirited, young, lovelorn lass. As with any post–Holocaust Merchant, this production had to address the play’s (and Shakespeare’s) racism. Interestingly, even as Sullivan played up Venice’s racist society, he danced away from the more expressed racism of Belmont, especially in cutting Portia’s racist dismissal of the Prince of Morocco. Given that Blake is a woman of color, leaving the line in might have left an awkwardness between Portia and Nerissa that might have derailed the production’s ultimate purpose. Ramping up that purpose, Sullivan inserted a whole new scene, Shylock’s baptism, between the ring exchange and return to Belmont. It revealed an ultimately defiant Shylock, but also forecast the rise of Nazism as the Jew stalks past thugs and soldiers cast in giant brownshirt-like shadows against the back wall. Impressive, but even in its heavy-handed imagery, it ultimately seemed nothing more than a chance to give Pacino a big exit.